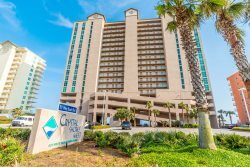 Your ultimate family beach vacation begins here, on the sugar-white sands of the Gulf Shores, a seemingly endless 32 mile stretch of sand so soft it squeaks under your feet, pristine turquoise waters and peaceful seclusion. All the ingredients for the best beach vacation perfectly spiced up with beach activities, world-class fishing and a hub of attractions right here on Pleasure Island. So, grab your beach umbrella, bucket, and shovel and let’s explore the unique beaches of Gulf Shores, some of the best beaches in Alabama! Bordering the splendid shores of Florida’s Perdido Key on the Emerald Coast, Orange Beach is the most popular Gulf Shores Beach. 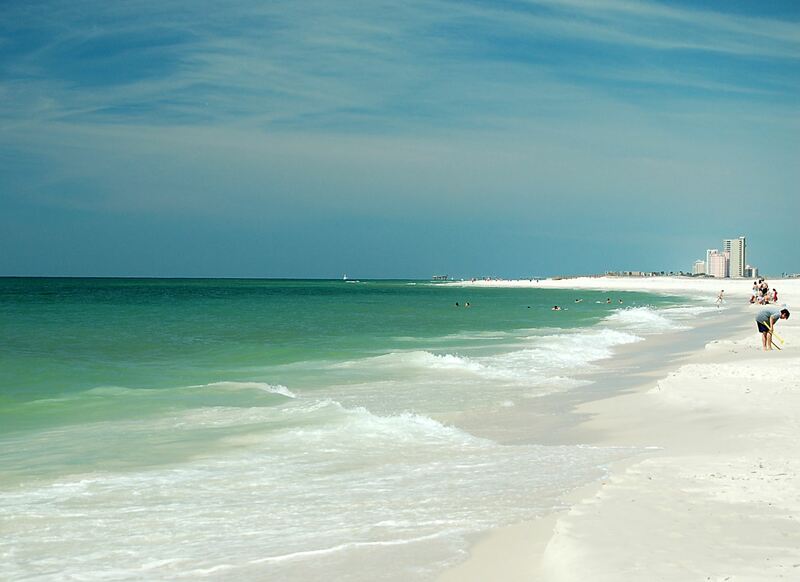 A perfect combination of 8 miles of pure white sands, sparkling waters and outdoor adventures. The wide beaches make it the perfect family beach with plenty of fun water sports to enjoy. Dive to Alabama’s first purpose-sunk shipwreck, The Lulu, on an artificial reef and picnic at the Waterfront Park set on the scenic Wolf Bay where little ones can fish off the pier. You can explore not only the beautiful gulf salt waters but kayak the waterways of the interior bays and bayous lying just north of Perdido Pass. Head off on a deep sea fishing excursion from Zeke’s landing marina returning to see the reflection of the sun on the crystal blue waters as it bids farewell to a fun action-packed day. Another favorite amongst both tourists and locals is the vibrant, action-packed Gulf Shores Public Beach. Infused with beach hangouts, restaurants, and beach shops, these soft white sands invite you to build sand castles, get active with a game of volleyball or enjoy quiet, chill time with your family and friends as you unwind on the warm shores of the Gulf. Three open-air pavilions and picnic areas provide the perfect shady hang-out spot for a quick bite. The activities here are endless with jet skiing, parasailing, banana boats and the unforgettable experience of flying the trike high in the skies above the Alabama coastline! There are many public access points along West Beach Blvd. with easy access to the beach, free parking, outdoor showers and a boardwalk directly to the sands. The main public beach access is along Gulf Shores Parkway where Highway 59 dead ends into the Gulf. This is where the action is, so get there early before it gets busy! Jutting into Mobile Bay on the Fort Morgan peninsula is the quiet and less crowded West Beach, a heavenly retreat of warm, gentle waters tumbling to the shore, perfect for even the youngest beach lovers. West Beach stretches 6 miles from Gulf Shores Parkway to the end of Dolphin Drive and the further west you go the more tranquil it gets. Inspire your senses here as you smell the ocean air, feel the glistening sand between your toes and watch seagulls soaring through the air as the gentle waves lap the shoreline. Tucked away between Orange Beach and Gulf Shores lies 6,000 acres of preserved land with two miles of pristine beaches. Outdoor pavilions and shaded picnic areas nestle amidst the dunes and wild sea oats, air-conditioned restrooms and showers provide comfort for sandy bodies and a fireplace promises the gift of warmth as the sun sets. This scenic oasis offers adventure for the entire family Nature lovers can go in search of wildlife and alligators on the Back Country Trail, adrenaline lovers can head to the Adventure Center for ziplining and fishing enthusiasts have the perfect spot for fishing on the pier. An added bonus - the scenic Lake Shelby! The perfect retreat for water skiing, boating or a quiet picnic with a special spot for your pooch at the dog pond and park. If you are looking for waves, Cotton Bayou is the spot for surfers. This small beach lies at the intersection of Highway 182 and 161 near Orange Beach across the road from Cotton’s, the oldest and most famous eatery on Pleasure Island. Bon Secour National Wildlife Refuge, on the Fort Morgan Peninsula, offers 7,000 acres of undisturbed coastal habitat, tucked away from the crowds. Miles of secluded rolling dunes, white sand beaches and trails and nature walks make this the perfect beach choice for nature lovers. Pick up a map and explore the trails in search of sea turtles, bird life, alligators, armadillos, and the endangered Alabama Beach Mouse, cast a line at Gator Lake or escape to the seclusion of the rolling dunes to soak up the sun. Be sure to explore the nearby historic Fort Morgan, the guardian of Mobile Bay since 1834. Drive aboard the Mobile Bay Ferry for the ‘Gulf Coast’s Most Scenic Drive’ to Dauphin Island, Alabama’s 14-mile-long barrier island. Relax and unwind as you visit the island’s scenic beaches and beachfront parks with shell-covered sparkling sands, nature trails, and waterways and fishing piers for anglers. The miles of undeveloped shores offer plenty of room for anglers, beachcombers, and families to enjoy a relaxed day at the beach. The entire island is a bird sanctuary, so before you head home be sure to visit the Audubon Bird Sanctuary, encounter the stingrays at the Estuarium Aquarium and get a glimpse into the island’s colorful history at the historic Fort Gaines. The beaches of Dauphin Island are pet-friendly, so no need to leave your pooch at home! The vibrant artsy town of Fairhope lies a little north of Gulf Shores with panoramic views over Mobile Bay. Fairhope has a few small beaches but the beach is not the draw here! The pier is the perfect place to watch the sunset over Mobile Bay, and if you are lucky enough you may get to experience a jubilee - a natural phenomenon where fish, crabs and other marine life wash ashore. The shores of Fairhope are one of the few places in the world where this happens! Escape the ordinary and join us in the Gulf Shores for the ultimate Alabama Beach vacation. 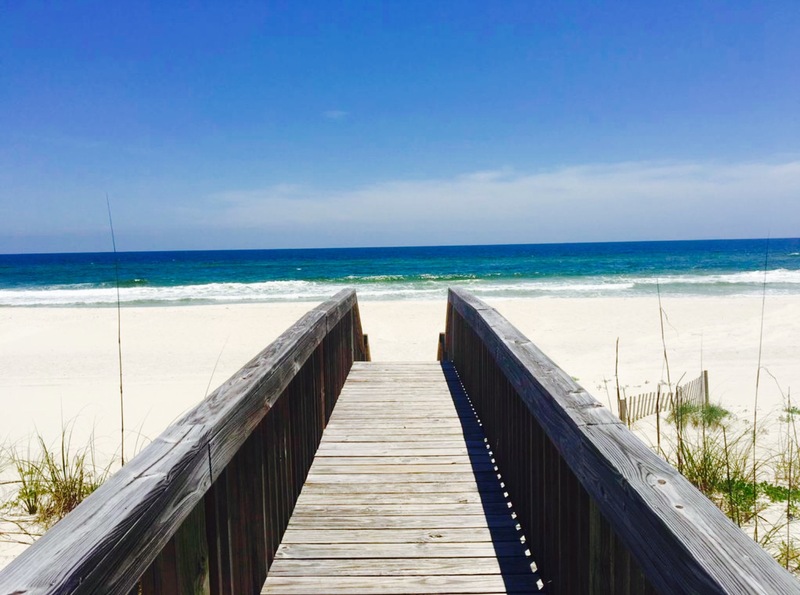 Whether you are looking for a beachfront home or condo or a back bay home along the waterways, Flip Flop Vacations has the perfect Gulf Shores vacation rental in our slice of heaven, the tropical paradise we call home – Gulf Shores, Alabama.